Intel Corporation (INTC) designs, manufactures, and sells integrated digital technology platforms primarily in the Asia-Pacific, the Americas, Europe, and Japan. This dividend achiever has paid dividends since 1992 an increased them for 10 years in a row. The company’s last dividend increase was in July 2012 when the Board of Directors approved a 7.10% increase to 22.50 cents/share. The company’s peer group includes Altera (ALTR), Xilinx (XLNX) and Advanced Micro Devices (AMD). Over the past decade this dividend growth stock has delivered an annualized total return of 4.50% to its shareholders. The company has managed to deliver a 20.10% average increase in annual EPS since 2002. Most of the increase came over the past two years however. Before that, earnings were following a rollercoaster pattern. Analysts expect Intel to earn $2.10 per share in 2012 and $2.03 per share in 2013. 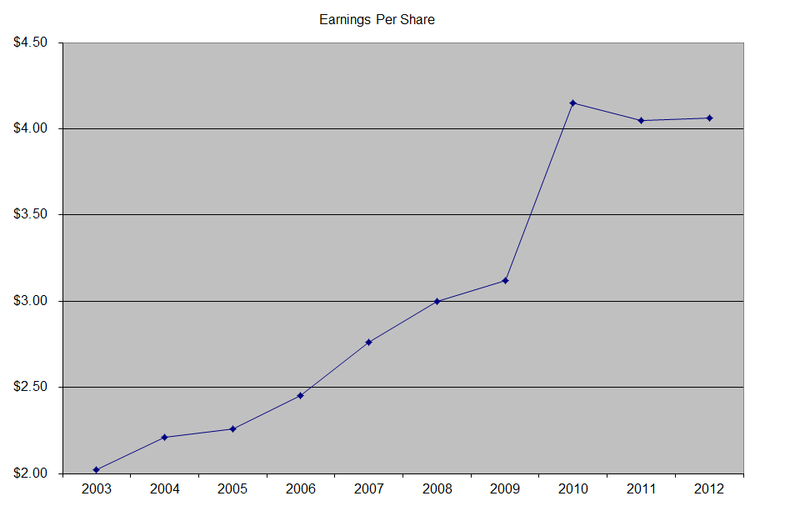 In comparison, the company earned $2.37/share in 2011. The company is the dominant supplier of microchips for the computer industry worldwide. Its heavy investment in R&D have ensured that it maintains its dominant position in the market. Unfortunately, the market for traditional computers and notebooks is starting a long decline in units sold as more consumers are going mobile and embracing tablets. Intel has not been very successful in gathering a key position as a supplier of semiconductors for tablets and mobile phones. While shares are really cheap and trading at a super low P/E ratio, the real question is whether earnings will be flat over time or whether they will decrease. If earnings dip due to declines in PC sales and company’s inability to break into mobile, further growth in the dividend will be severely limited and it might even be at risk for a cut. Technology companies are notorious for being in an industry where rapid changes in products due to innovation lead to obsolescence and loss of consumers and revenues. As a dividend investor, I keep asking myself whether the dividend is secure, and whether I can rely on it for the next decade and beyond. While the yield is very high, I have strong doubts that the party would last for long. Even under the best case scenario, it looks like flat earnings would limit growth in distributions, but investors would still get paid a very respectable 4.50% yield for a few years. Shares might even double in value, mostly due to P/E multiple expansion. Of course, what happens if the market actually expects an EPS of $1/share by 2020? That being said, given the fact that Intel is a market leader in the still very lucrative semiconductor market for PC’s, it has the scale to deliver product at a lower cost than competitors such as AMD. I doubt that the PC is going away, as I simply cannot foresee all businesses replacing computers with tablets. However, companies that end up selling less product than anticipated, might end up with extra inventory that might have to be written down. Inventory obsolescence is a particular concern for technology companies, because technology changes so quickly. The return on equity has closely followed the trends in earnings per share over the past decade. Rather than focus on absolute values for this indicator, I generally want to see at least a stable return on equity over time. The annual dividend payment has increased by 25.60% per year over the past decade, which is higher than the growth in EPS. A 25% growth in distributions translates into the dividend payment doubling every three years on average. If we look at historical data, going as far back as 1994, one would notice that the company had managed to double distributions every three years on average. The dividend payout ratio has increased from 17.40% in 2002 to 72.70% in 2009, before reaching a more sustainable 32.60 % in 2011. A lower payout is always a plus, since it leaves room for consistent dividend growth minimizing the impact of short-term fluctuations in earnings. Currently Intel is trading at 8.80 times earnings, yields 4.50% and has a sustainable distribution. Despite the ultra-low valuation, I am hesitant to pull the trigger on this one, due to my inability to determine whether Intel will be able to keep innovating and maintain profitability in the long run. Because of my inability to gauge whether tectonic shifts in technologies will impact the long-term picture for Intel, I will maintain a hold opinion on the stock. I am also unable to determine whether Intel will be able to boost earnings in the near term. That being said, the company’s shares can easily rebound from current lows, and its dividend yield would probably be sustained for the next several years. In addition, it also would add some exposure to technology for my income portfolio. While I am neutral on the stock, I plan on initiating a small started position by the beginning of next year, subject to availability of funds. As outlined in my dividend retirement plan, my ultimate goal is to reach financial independence. This would be achieved at the so called dividend crossover point, which is the point at which dividend income exceeds expenses. Achieving this long-term goal however takes time, patience and persistence in sticking to and executing your plan. It helps to break down the long-term goal into a plan with achievable and actionable steps. For example, if you goal is to retire in 10 years, the sub-steps could include achieving a 10% coverage of your target income in year 1, 20% in year 2 etc. It is also important to readjust your plan accordingly, and be realistic about the external environment. For example, if hitting your target requires you to invest in dividend paying stocks yielding 4%, when the quality income stocks pay only 3% on average, you need to account for that. On the contrary, if you manage to receive a large lump-sum to invest (bonus or inheritance), and you are now 15% closer to achieving your goal instead of 10%, you need to readjust your goals for next year. One of the goals for my income portfolio is achieving a 6% annual organic dividend growth. This growth ignores the effect on dividend income of reinvestment and addition of new funds. I usually look at the portfolio composition at the end of the prior year, and calculate the estimated dividend income for the new year. I then compare the estimated income for current year, to the estimated income for new year and check to see if I have achieved my goal. I believe that a 6% goal in average dividend growth is achievable, as it is only about 0.50% more than the long-term average dividend growth in the Dow Jones Industrials Average index. This is an important metric, because once I retire, I would need to have my dividend income safely increase above the rate of inflation, in order to keep its purchasing power over time. 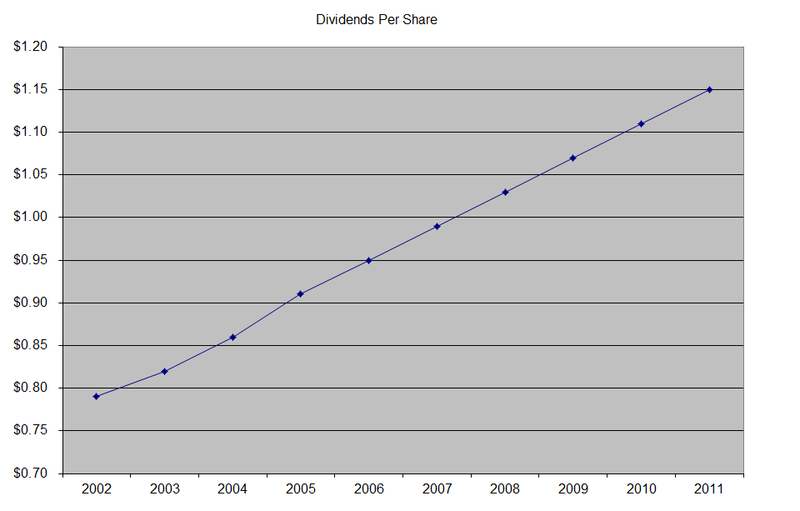 In 2012, my dividend income grew by 7.10%. Of course, my total income increased faster than that because I reinvest dividends and also add new funds to my portfolio. My income goal is to reach a 60% dividend income replacement ratio. 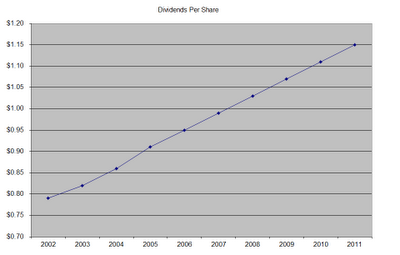 This means that my dividend income would cover roughly 60% of my expenses in 2013. In 2012, the percentage was roughly 50%. I do not speak in numbers in order to avoid extra unnecessary confusion. If my target monthly income was $10,000, this would cause discussion that this is too much, and is not realistic. The discussion would go in the direction that I need to spend less. If my target monthly income was $1,000, then the discussion would go in a way that this income is not sufficient for someone to live on. After all, these are my numbers, so the numbers that would work for you are much different. The interesting thing about dividends is that they are not typically paid evenly every month, which is OK This is why, when I discussed in an earlier article my dividend crossover point, my income seemed to exceed 60% of expenses in several months of the year. However, these are typically the months of November, August, May and February, when my Master Limited Partnerships pay their generous distributions. In summary, my goals for 2013 are part of a long-term roadmap that would help me to reach out my long-term goal of retiring using dividend stocks. These goals will be achieved by owning qualirty dividend stocks which grow distributions by at least 6%/annually. The next two steps include reinvesting dividends selectively and adding new funds in attractively priced quality income stocks. Becton, Dickinson and Company (BDX), a medical technology company, develops, manufactures, and sells medical devices, instrument systems, and reagents worldwide. The company has raised distributions for 41 years in a row. Over the past decade Becton Dickinson has managed to boost dividends by 15.70%/year. The stock is trading at 14.10 times earnings and yields 2.30%. I plan on initiating a position in this stock somewhere in first quarter of 2013, as long as it trades below $79.20/share. Check my analysis for more details. McDonald’s Corporation (MCD) franchises and operates McDonald's restaurants in the global restaurant industry. The company has raised distributions for 36 years in a row. 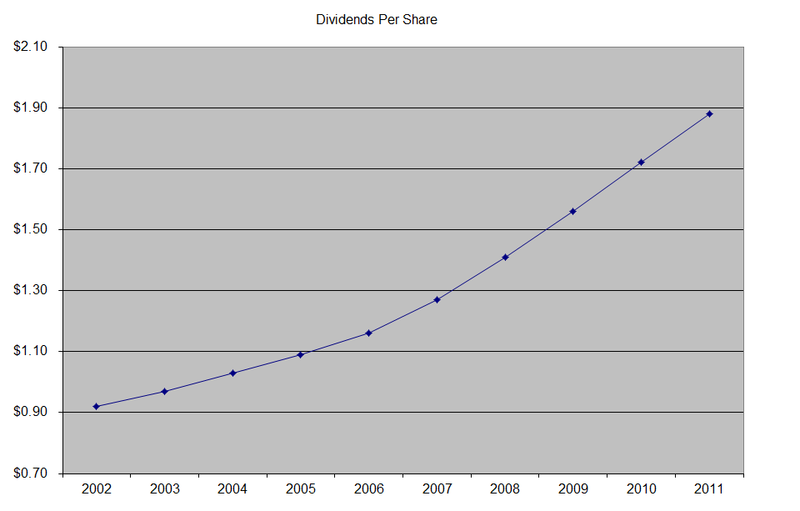 Over the past decade McDonald’s has managed to boost dividends by 27.40%/year. The stock is trading at 17 times earnings and yields 3.40%. This is the cheapest valuation for this global blue chip that I have ever seen, and I think that the stock has been beaten up unjustifiably. Check my analysis for more details. Wal-Mart Stores, Inc. (WMT) operates retail stores in various formats worldwide. The company has raised distributions for 38 years in a row. Over the past decade Wal-Mart Stores has managed to boost dividends by 17.90%/year. The stock is trading at a 14.10 times earnings and yields 2.30%. Check my analysis for more details. The company was attractively valued for a brief period in 2011 – 2012. I plan on adding to my position in the retailer on dips below $64, assuming. If dividends increase by 8% in March 2013 however, the current prices around $69/share would make it attractively priced for me. YUM! Brands, Inc. (YUM), together with its subsidiaries, operates quick service restaurants in the United States and internationally. The company has raised distributions for 8 years in a row. Over the past five years YUM! Brands has managed to boost dividends by 31.30%/year. The stock is trading at 18.80 times earnings and yields 2.10%. I like the recent weakness in the stock, which I consider to be short-term in nature. If the stock falls further to $54/share, I plan on adding to my position in it. If the company’s stock price remains relatively flat in 2013, but dividends increase by approximately 15%, I might consider adding to my position in the stock. This of course is just a sample of the types of companies I plan to add to in 2013, as I will probably do somewhere between 24 – 36 purchases. As I mentioned in my dividend retirement plan, I am an investor in the accumulation phase. I plan on being financially independent in a few years through my contributions of fresh capital into new or existing positions that are trading at attractive valuations. In addition, I also focus on strategic reinvestment of distributions into companies with whose stocks meet my entry criteria. While I do follow several strict criteria for initial screening, a large part of my asset allocation is invested based on qualitative characteristics and my own biases. I also try to follow a strategy, where I stop contributing to an existing brokerage account, once my contributions reach $100,000. As I explained in an earlier article, the purpose behind this strategy is to ensure that I do not lose my whole nest egg if a broker fails and I have more than $500,000 invested there. I assume that over time, my $100,000 investment is going to produce capital gains that would eventually lead to my account balance exceeding $500,000. If stock prices rise by 7% annually in the future, I would likely exceed that account balance in over two decades from now. I typically purchase somewhere between one to three investments each month. My lot size has increased over the past 3 years, as I no longer invest using brokers that offer free trades. As a result, it is much cheaper to spend $5 - $7/trade by investing $2000 at a time, rather than investing $1000 at a time. This means that if I purchase two securities on average every month, I might end up adding to an existing position approximately once an year, sometimes even less often. This is because my portfolio consists of over 45 individual stocks, although I find less than 30 or so to be worthy of my future investment dollars. The rest are holds either because they are overvalued right now ( Yum! Brands(YUM)), have slow or no dividend growth (Con Edison (ED)), or have an abnormally high weight in my portfolio (Phillip Morris International (PM)). Chevron Corporation (CVX), through its subsidiaries, engages in petroleum, chemicals, mining, power generation, and energy operations worldwide. This dividend champion has managed to boost distributions by 8.80%/year over the past decade. 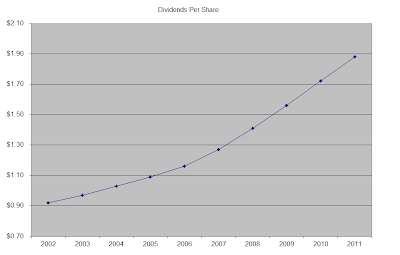 Chevron has raised dividends for 25 years in a row. The stock trades a t8.80 times earnings and yields 3.40%. Check my analysis of the stock. Aflac Incorporated (AFL), through its subsidiary, American Family Life Assurance Company of Columbus, provides supplemental health and life insurance. This dividend champion has managed to boost distributions by 20.40%/year over the past decade. Aflac has raised dividends for 30 years in a row. The stock trades at 8.90 times earnings and yields 2.60%. Check my analysis of the stock. Unilever PLC (UL) operates as a fast-moving consumer goods company in Asia, Africa, Europe, and the Americas. This dividend achiever has managed to boost distributions by 9.90%/year over the past decade. Unilever has raised dividends for 12 years in a row. The stock trades at 20.80 times earnings and yields 3.30%. Check my analysis of the stock. Air Products and Chemicals, Inc. (APD) provides atmospheric gases, process and specialty gases, performance materials, equipment, and services worldwide. This dividend champion has managed to boost distributions by 11.10%/year over the past decade. Air Products and Chemicals has raised dividends for 30 years in a row. The stock trades at 15.30 times earnings and yields 3.10%. Check my analysis of the stock. Abbott Laboratories (ABT) engages in the discovery, development, manufacture, and sale of health care products worldwide. his dividend champion has managed to boost distributions by 8.70%/year over the past decade. Abbott Laboratories has raised dividends for 40 years in a row.The stock trades at 16.20 times earnings and yields 3.10%. Check my analysis of the stock. McDonalds Corporation (MCD) franchises and operates McDonald's restaurants in the global restaurant industry. This dividend champion has managed to boost distributions by 27.40%/year over the past decade. McDonalds has raised dividends for 36 years in a row. The stock trades at 16.90 times earnings and yields 3.50%. Check my analysis of the stock. Enterprise Products Partners L.P. (EPD) provides midstream energy services to producers and consumers of natural gas, natural gas liquids (NGLs), crude oil, refined products, and petrochemicals in the United States and internationally. This dividend achiever has managed to boost distributions by 7.60%/year over the past decade. Enterprise Products Partners has raised distributions for 15 years in a row and yields 5.20%. Check my analysis of this master limited partnership. In order to add to new or existing positions, I tend to look at valuation, portfolio weight and my outlook for the enterprise over the next few years. I am sometimes willing to add to my position in a stock, even if doing so would result in an above average weight for a short period of time, if shares are trading at a relatively low valuation. There has been a lot of talk lately about the Fiscal Cliff. To summarize, this is when Federal spending would automatically decrease and there would be automatic increases in tax rates. The combination of these two events is likely to cause some shockwaves to the US economy. Of course, even if politicians somehow agree to resolve the issue, the markets would probably react in a way to show that they don’t like important issues being resolved or postponed all the time. As a long-term investor, I typically focus on such short-term noise because it is simply out there, and cannot be avoided. I do not think however that it would have such a large long-term impact that most news pundits are forecasting. I also do not follow daily market fluctuations in the stock market, which is why a 300 point move of the Dow Jones Industrials does not register for me. The fact that certain stocks are getting closer to my buy range is making me excited, but other than that I see the fiscal cliff talk as a non-event. I typically try to focus my energy on companies that I believe have the potential to grow earnings over time. I focus on the business model, try to understand who the customers and whether the business has any pricing power. I also try to understand at a high level what factors will help it grow earnings over time. For example, a lot of asset management firms like Eaton Vance (EV) are catering to the needs of millions of investors in the US, who are trying to save to retirement. Eaton Vance is selling different financial products, and earning a management fee on the assets under management. In a previous article I mentioned that the 70 or so million baby boomers need financial products to help them invest for and during retirement. In addition, plenty of younger people just entering the workforce are realizing that they might not be able to rely on traditional pension or social security benefits for retirement, and therefore need to save for their golden years on their own. That is why I find companies selling financial products to have excellent growth prospects. Another growth story is the rise in the number of middle class families in emerging markets such as India, Brazil, Indonesia, Turkey and many countries in Eastern Europe. This would lead to increase in demand for products that many US consumers use on a daily basis. I think that companies such as Procter & Gamble (PG), Coca-Cola (KO) and McDonald’s (MCD) would certainly benefit from the rise in the middle class globally over the next couple of decades. The most interesting thing about many of the quality dividend kings I have outlined previously is that they have managed to boost dividends for over 50 years in a row. This includes a few wars, countless recessions as well as situations where the top tax rates of dividends were way over 70- 80%. That is why I do not believe that increasing the top tax rate for dividend income to 43% is going to mark the end to dividend investing. The problem is that the majority of income investors are not going to make more than $250,000 in annual income. As a result, their tax increases will be minimal at best. In addition, a large portion of stock investments in this country are held in tax-advantaged accounts such as 401(k) plans or Roth Ira’s. Most investors that I know personally, have their house and their retirement accounts as their largest assets. In addition, we have plenty of foundations, endowments etc, which hold investments in stocks, bonds and other instruments. Many of these institutions do not pay taxes on their investment income. Next, while most investors in dividend paying stocks will see an increase in their dividend tax rates, this tax bite would not be at 43%. In addition, I have always tried to stress that in investing, one needs to focus their attention on making a profit on their investment, and only then worry about taxation of their profits. I would much rather have a portfolio that delivers a passive stream of income that grows above the rate of inflation every year until the day I day but produces tax liabilities, than a portfolio that delivers no gains but tax benefits. In addition, for me and countless other investors, purchasing dividend stocks today surely beats purchasing fixed income instruments which are offering record low yields. Many companies are now offering special dividends, right before the preferential treatment of dividend income expires at the end of 2012. While many articles and pundits tell you to ignore these payments, I am actually keeping a close look. The reason behind my contrarian view is that these special dividends will decrease stock prices, therefore making valuations and current yields from recurring distributions much more attractive. Wal-Mart Stores, Inc. (WMT) operates retail stores in various formats worldwide. The company has raised distributions for 38 consecutive years. Over the past decade, this dividend growth stock has managed to boost distributions by 17.90%/year. Wal-Mart Stores trades at 13.40 times earnings and yields 2.30%. Check my analysis of the stock for more details. Becton, Dickinson and Company (BDX), a medical technology company, develops, manufactures, and sells medical devices, instrument systems, and reagents worldwide. The company has raised distributions for 41 consecutive years. Over the past decade, this dividend growth stock has managed to boost distributions by 15.70%/year. Becton Dickinson trades at 14.10 times earnings and yields 2.60%. Check my analysis of the stock for more details. Brown-Forman Corporation (BF/B) engages in manufacturing, bottling, importing, exporting, and marketing alcoholic beverages. The company has raised distributions for 29 consecutive years. Over the past decade, this dividend growth stock has managed to boost distributions by 9.50%/year. The stock trades at 24.70 times earnings and yields 1.60%. Check my analysis of the stock for more details. Colgate-Palmolive Company (CL) , together with its subsidiaries, manufactures and markets consumer products worldwide. The company has raised distributions for 49 years in a row. Over the past decade, this dividend growth stock has managed to boost distributions by 12.90%/year. The stock trades at 21 times earnings and yields 2.30%. Check my analysis of the stock for more details. V.F. Corporation (VFC) designs and manufactures, or sources from independent contractors various apparel and footwear products primarily in the United States and Europe. The company has raised distributions for 40 consecutive years. Over the past decade, this dividend growth stock has managed to boost distributions by 10.90%/year. The stock trades at 16.60 times earnings and yields 2.30%. Check my analysis of the stock for more details. YUM! Brands, Inc. (YUM), together with its subsidiaries, operates quick service restaurants in the United States and internationally. The company has raised distributions for 9 consecutive years. The stock trades at 19.90 times earnings and yields 2%. The J. M. Smucker Company (SJM) engages in manufacturing and marketing branded food products primarily in the United States, Canada, and internationally. The company is a member of the dividend achievers index, and has boosted distributions for fifteen years in a row. The company’s last dividend increase was in July 2012 when the Board of Directors approved an 8.30% increase to 52 cents/share. The company’s largest competitors include Conagra (CAG), Kraft (KFT) and Hershey (HSY). The company has managed to deliver an 8% average increase in annual EPS since 2003. Analysts expect J. M. Smucker to earn $5.15 per share in 2013 and $5.65 per share in 2014. In comparison, the company earned $4.06/share in 2012. Future increases in earnings would likely be generated by acquisitions and some by cost restructuring. The company acquired Folgers Coffee by Procter & Gamble (PG) in 2008. I n 2011 it purchased private held Rowland Coffee Roasters and in 2012 it acquired Sara Lee’s North American Coffee and Hot Beverage division. In addition, the company has also taken the initiative to improve operations and production efficiencies, and improving its cost base. However, the company seems to be struggling with passing on cost increases over to consumers, as it recently had to decrease prices for Folgers coffee in order to maintain market share. The return on equity has decreased 13.70% in 2003 to 8.70% in 2012. Rather than focus on absolute values for this indicator, I generally want to see at least a stable return on equity over time. The annual dividend payment has increased by 11.10% per year over the past decade, which is much higher than the growth in EPS. This was achieved mainly through the expansion in the dividend payout ratio. An 11% growth in distributions translates into the dividend payment doubling almost every six and a half years. If we look at historical data, going as far back as 1997 we see that J. M. Smucker has actually managed to double its dividend every seven and a half years on average. 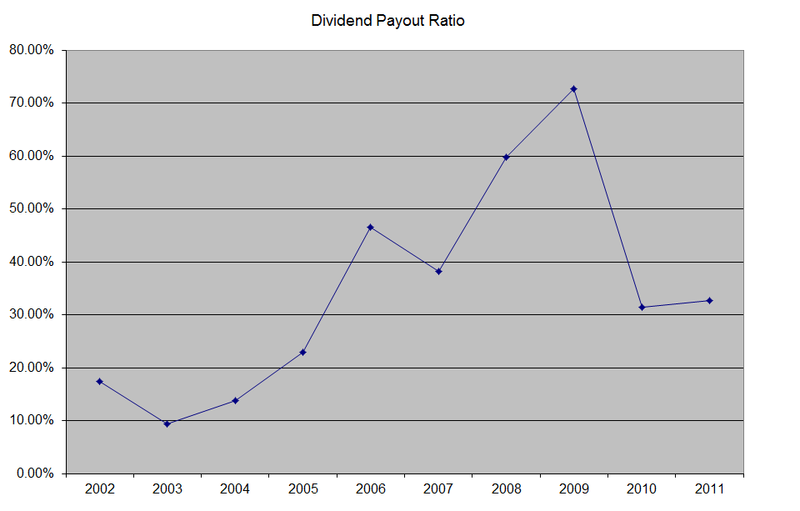 The dividend payout ratio has increased from 37.60% in 2003 to 46% in 2012. A lower payout is always a plus, since it leaves room for consistent dividend growth minimizing the impact of short-term fluctuations in earnings. Currently, J. M. Smucker is slightly overvalued, trading at 21.10 times earnings and yielding 2.40%. I would consider adding to my position in the stock on dips below 81.50/share. - McCormick & Company (MKC) Dividend Stock Analysis 2011. Stryker Corporation (SYK), together with its subsidiaries, operates as a medical technology company. The company raised quarterly distributions by 24.70% to 26.50 cents/share. This dividend achiever has boosted dividends for 20 years in a row. Over the past decade, the company has managed to boost distributions by 33.50%/year. Currently, it is trading at 14.60 times earnings and yields 2%. Stryker earned 3.45$/share in 2011. Estimates are for EPS to reach $4.05 in 2012 and $4.30 in 2013. I would add the stock to my list for future analysis. The company’s business model is exposed to the cyclical swings in the economy. Between 2006 and 2008 the company’s business was booming, and it was passing on special dividends to shareholders. Since then, the company’s dividend increases have been small. Once business picks up again, dividends will grow at a higher rate. I do not plan on adding to my position in the stock however. Check my detailed analysis of the stock. C.H. Robinson Worldwide, Inc. (CHRW), a third-party logistics company, provides freight transportation services and logistics solutions to companies in various industries worldwide. The company raised quarterly distributions by 6.10% to 35 cents/share. This dividend achiever has boosted dividends for 16 years in a row. Over the past decade, the company has managed to boost distributions by 27.80%/year. Currently, it is trading at 22 times earnings and yields 2.30%. Although the stock is overvalued, I would add it to my list for further research. The yield is lower than my entry of 2.50%, and the streak is lower than 10 years. However, I would continue monitoring the company, and may add it to my list for further research. Over the past decade, the company has managed to boost distributions by 5.20 %/year. Currently, it is trading at 11.50 times earnings and yields 3.10%. 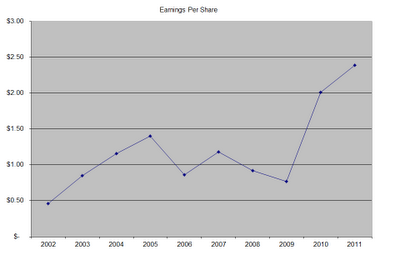 In 2002 EPs was $2.01/share, which means that earnings have not increased much over the past decade. Given analysts’ expectations for low earnings decrease over the next two years to $2.38 in 2012 I do not expect much in future dividend growth either. Currently, it is trading at 12.60 times earnings and yields 3.70%. The past three dividend increases have been anemic at best. The slow pace of dividend hikes is particularly interesting in comparison to the rosy outlook for EPS growth to $1.89/share in 2013 and $2.19/share in 2014. Compare this to the EPS from 2012, which was $1.68/share. Linear Technology Corporation (LLTC), together with its subsidiaries, designs, manufactures, and markets various analog integrated circuits (ICs) worldwide. The company raised quarterly distributions by 4% to 26cents/share. This dividend achiever has boosted dividends for 21 years in a row. Over the past decade, the company has managed to boost distributions by 20.40%/year. Currently, it is trading at 20 times earnings and yields 3.10%. Over the past five years however, dividend growth has slowed down, as the dividend payout ratio has crossed 50%. I would add the stock to my list for further research. Piedmont Natural Gas Company, Inc.(PNY) , an energy services company, engages in the distribution of natural gas to residential, commercial, industrial, and power generation customers in portions of North Carolina, South Carolina, and Tennessee. This dividend champion has boosted distributions for 34 years in a row. The company’s last dividend increase was in March 2012 when the Board of Directors approved a 3.40% increase to 30 cents/share. The company’s peer group includes Dominion Resources (D), AGL Resources (GAS) and Atmos Energy (ATO). Over the past decade this dividend growth stock has delivered an annualized total return of 10.40% to its shareholders. The company has managed to deliver a 5.80% average increase in annual EPS since 2002. Analysts expect Piedmont Natural Gas to earn $1.78 per share in 2012 and $1.89 per share in 2013. 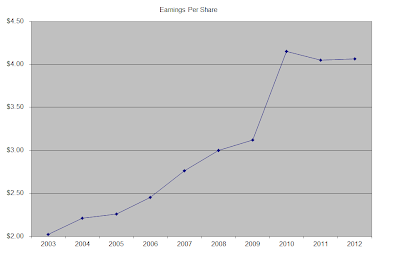 In comparison, the company earned $1.57/share in 2011. The return on equity has remained above 10% over the past decade. Rather than focus on absolute values for this indicator, I generally want to see at least a stable return on equity over time. The annual dividend payment has increased by 4.20% per year over the past decade, which is lower than the growth in EPS. A 4% growth in distributions translates into the dividend payment doubling almost every eighteen years. Piedmont’s current dividend is double the amount that was paid fifteen years ago. The dividend payout ratio has been decreasing over the past decade, falling from almost 83% in 2002 to 57% in 2010, before increasing in 2011. A lower payout is always a plus, since it leaves room for consistent dividend growth minimizing the impact of short-term fluctuations in earnings. Currently Piedmont Natural Gas is trading at 20 times earnings, yields 3.80% and has a sustainable distribution. I would consider adding to my position in the stock subject to availability of funds. In a previous article I argued that entry price matters to investors. Even the best quality dividend growth stocks like Coca Cola (KO) or Wal-Mart (WMT) are not worth owning at any price. In fact, investors who purchased these stocks in the early 2000’s, saw lackluster returns for over a decade. While earnings and dividends were growing at a fast pace throughout that period, it took almost a decade before the low initial yields became noticeable and before the valuations appeared attractive again. In fact, despite the rise in earnings over the past decade, stock prices for these two companies didn’t have much to show for it. On the other hand however, purchasing dividend stocks at attractive valuations can help investors lock in an accidentally high yield. I usually find at least 15 -20 attractively valued dividend stocks ready to be bought at any time in my monthly screening process. However, I also typically uncover some rapidly growing companies, which increase distributions at a double digit pace, but trade at high valuations. As a disciplined income investor, I monitor these securities on a regular basis and add mental entry points should they reach undervalued territory. In order to reach my long term dividend goals, it really does make a difference whether I purchase a company growing earnings and distributions at 7% when its yield is 2% or 3%. In the first case, after one decade, my yield on cost will be 4%. In the second case, my yield on cost would be 6%. Once or twice per year however, markets tend to get upset about something. It could be the US sub-prime mortgage crisis in 2008 – 2009 or the fiscal cliff in August and September 2011. Once markets get upset about something, investors start selling off fearing the worst. Business news commentators flash warning signs that the economy is about to collapse, earnings will plummet, unemployment will skyrocket and how humanity would revert back to living in caves very soon. This leads to decreases in share prices, because market participants now see stocks as inherently riskier than before. Many companies that previously traded at above-average valuations will now become fairly valued. This is the point when regularly monitoring the market will pay off for long-term dividend investors. If they had done their homework, and have confidence in their analysis that the attractively valued income stock will maintain and increase earnings power over time, then they will have the chance to buy it at bargain prices. This will be a very difficult decision, since the investor will be seemingly going against everyone else’s warning of economic decline. For example, I was able to purchase several stocks between September 2008 and February 2009 at super attractive valuations. It was a very scary period in my investment career, as I feared that this time the economy will collapse. Nevertheless, I kept to my plan to regularly investing in dividend stocks though despite all the gloom. I did have to sell a few of my dividend holdings in the period however, since they cut or eliminated distributions. I replaced these stocks with other companies that were fairly valued at the time. For a company with a stable business model characterized by recurring revenue streams, a decrease in price by 50% doubles its dividend yield. If the dividend is well covered by earnings, then chances are that it won’t be cut, which makes the investment attractive to income seeking individuals. For example, Aflac (AFL) traded in the high $50’s in 2008. However, during the general decline in all financial stocks, I was able to snap some at approximately $25/share in early 2009. At the same time, the quarterly dividend was increased from 24 cents/share in last quarter of 2008 to 28 cents/share for the first quarter or 2009. The same company that yielded 1.50% less than a few months earlier was now paying a higher dividend and yielded more. I liked the fact that the company was expanding in Japan, and was building its brand in the US simultaneously, in addition to its attractive valuation. Another quality company I was able to purchase at low valuations included Altria Group (MO). In September 2008 the stock was trading around $20/share, and paid a quarterly dividend of 29 cents/share. By December 2008, Altria was trading at $15/share, and the dividend had been increased to 32 cents/share. The yield had thus increased from 5.80% to 8.50%. I liked the fact that people are more likely to keep habits such as smoking even in tough economic times, in addition to the ridiculously low valuation. The reason why this paid off for me was the fact that I held a diversified portfolio consisting of over 30 individual components. Each of these companies kept business as usual, as their customers kept buying products or services on a daily basis. These products or services are everyday essentials that consumers or businesses need in order to operate. For example, just because we are in a recession, people still brush their teeth, use electricity or shave every morning. The other thing that helped most of the companies I owned was the fact that they were and still are riding the long term trend where millions of consumers from emerging markets are entering middle class for the first time. This increases their customer base tremendously, and will likely do so for the next several decades. McDonald's (MCD) is attractively valued at 16 times earnings and yields 3.70%. The company has managed to raise dividends for 36 years in a row, and over the past decade has managed to boost them by 27.40%/year. Check here for a more detailed analysis of the stock. Medtronic (MDT) is attractively valued at 12 times earnings and yields 2.50%. The company has managed to raise dividends for 35 years in a row, and over the past decade has managed to boost them by 15.80%/year. Check here for a more detailed analysis of the stock. Walgreen (WAG) is attractively valued at 13.50 times earnings and yields 3.40%. The company has managed to raise dividends for 37 years in a row, and over the past decade has managed to boost them by 18.90%/year. Check here for a more detailed analysis of the stock. Becton, Dickinson and Company (BDX), a medical technology company, develops, manufactures, and sells medical devices, instrument systems, and reagents worldwide. The company raised its quarterly dividend by 10% to 49.50 cents/share. This marked the 42nd consecutive annual dividend increase for this dividend champion. Over the past decade Becton Dickinson has managed to boost distributions by 15.70%/year. Yield: 2.60%. Check my analysis of the stock for a more comprehensive view of the company. I really like Becton Dickinson at current valuation levels of 13.70 times earnings. The company has grown earnings per share from $2.07 in 2003 to $5.30 in 2012. Analysts estimate EPS to grow to $5.63 in 2013 and $6.14 by 2014. I would consider initiating a position in the stock subject to availability of funds. McCormick & Company (MKC), Incorporated engages in the manufacture, marketing, and distribution of spices, seasoning mixes, condiments, and other flavorful products to retail outlets, food manufacturers, and foodservice businesses. The company raised its quarterly dividend by 9.70% to 34 cents/share. This marked the 27th consecutive annual dividend increase for this dividend champion. Over the past decade McCormick & Company has managed to boost distributions by 10.80%/year. Yield: 2.10%. Check my analysis of the stock for a more comprehensive view of the company. The company has grown earnings per share from $1.29 in 2002 to $2.82 in 2011. Analysts estimate EPS to grow to $3.07 in 2012 and $3.36 by 2013. However, find McCormick to be overvalued at 22.20 times earnings. I would consider adding to my position on dips below $55. The company is trading at 16.30 times earnings, and has managed to grow EPS from $0.67 in 2003 to $1.90 in 2012. Analysts estimate EPS to grow to $1.94 in 2013 and $2.11 by 2014. Unfortunately, the yield is lower than my 2.50% entry criteria. I would consider initiating a position in the stock on dips below $27/share. The company has managed to boost earnings from 40 cents/share in 2002 to 71 cents/share in 2011. Analysts estimate EPS to grow to $0.72 in 2012 and $0.77 by 2013. Given the high dividend payout ratio, low dividend growth and relatively low yield for a utility of 3.20%, I view this stock as more of a hold than buy. Given the low growth in distributions over the past decade, and the high payout of 72%, I would rate the stock a hold. Despite the high current yield, the slow distributions growth would be unable to compensate against inflation. In addition, the current P/E ratio of 19.30 is rather high for a slow grower. I like the low P/E ratio of 16.10, but the slow growth in distributions over the past decade is troubling. 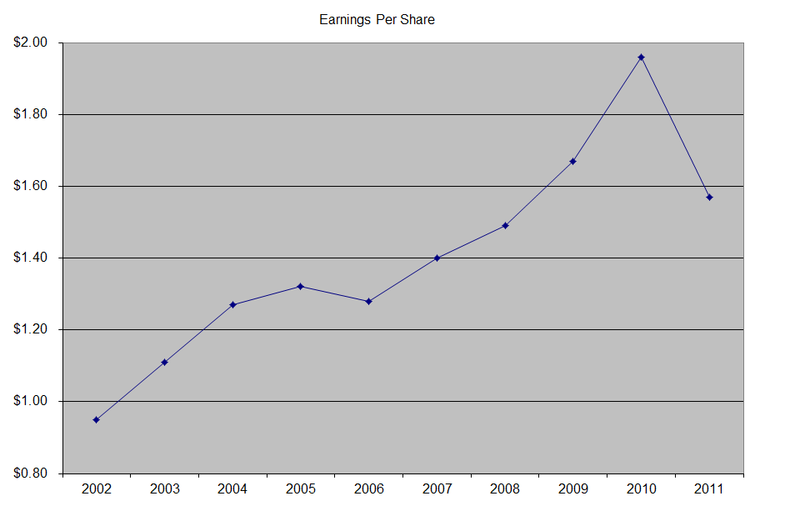 Earnings per share increased from $1.16 in 2002 to $3.50 by 2011. Analysts estimate EPS to grow to $3.55 in 2012 and $3.76 by 2013. I like the company’s low dividend payout ratio of 47.70%. I believe that there is room for distributions growth that is above average that for typical utility companies. I would add the company to my list for further research. The company is currently overvalued at 22 times earnings and a low yield of 1%. However, it has managed to boost earnings from $1.10/share in 2003 to $2.87/share in 2012. Analysts estimate EPS to grow to $3.10 in 2013 and $3.30 by 2014. I would continue monitoring the stock and the company, but at this stage the price is too high to warrant further investigation.